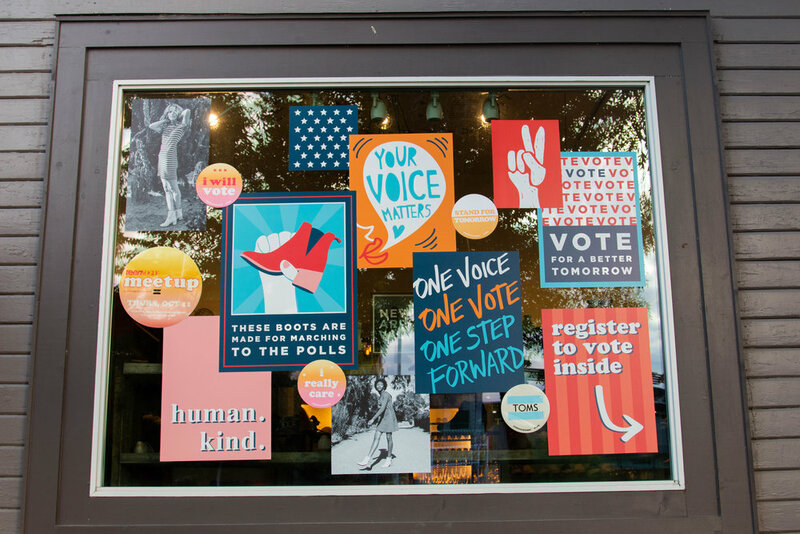 The display outside TOM’s on South Congress welcomed attendees to the Teen Vogue Meetup. The community needs more events that make attendees go to sleep buzzing from the social high. Teen Vogue’s Meetup stirred minds and hearts in Austin in a gathering of contagious, productive and inclusive energy at TOMS on Oct. 12. Austin’s TOMS store is tucked away in a renovated house on South Congress. Wooden interior decorates the half coffee-shop, half-store, and the cozy yard transforms into an event venue by night. They have created a space where they can directly interact with readers, and encourage networking and community empowerment for young people. This year’s meetup hosted Congressman Joaquin Castro of Texas Congressional District 20 and Ana Maria Rea of RAICES for a timely panel encouraging attendees to vote. A welcome sign encourages attendees at the event. All were welcome to the event as the evening presented an overarching theme of gratefulness. Each candidate praised their parents and a country that they attributed their success to. Castro was raised by two politically active parents and his mother ran for city council under La Raza Unida in 1971. “My mom is more fearless than I am, she ran when she was 23,” Castro says. Castro says he believes that politicians are responsible for building the infrastructure of opportunity in Texas. For this reason, he created the “Trailblazers College Tour,” which funded college visits for students of low income school districts to encourage pursuing higher education. He says many students with talent never even think about applying to some colleges on the East Coast because they do not have the support or sense of accessibility. Ana Maria Rea was not eligible for financial aid, but she finally pursued her dream of college at 25. She expressed sentiments that many could relate to. “I thought I wasn’t good enough for the books,” Rea says. Rea advised the audience to come to terms with their insecurities by understanding they are good enough, in any sense of the matter. “You are amazing just for waking up today,” Rea says, sharing that the little accomplishments and basic functions should be celebrated in a world of perpetual bad news cycles. As an immigrant, Rea advocates for rights, legal representation and marginalized communities at RAICES. She spoke of grave transgressions, sharing her visual of a two-year-old child separated from his family at the border, questioned by a judge. She has visited and worked with many children from U.S. Immigration an Customs Enforcement detention centers. Castro and Rea spoke to invigorate the crowd before them as they faced the next generation of this country. They did not patronize the young, but instead thanked them for the hope they offer. Rea warned those resisting change to watch out for the younger generation’s veracity and fighting spirit. Teen Vogue editor Vera Papisova, Ana Maria Rea and Joaquin Castro sit on stage and discuss immigration issues. The space was conversation-friendly and opening as lapels disclosed preferred pronouns and benches organized the space. Going alone to one of these events is almost more favorable because it gives an individual motivation to reach out to others. Every attendee was there with a purpose that they wrote on their nametags. The meetup provided an opportunity for attendees to connect with one another and discuss important issues. The evening was complete with voting cookies, guacamole, Amy’s ice cream and mocktails. The attendees were inspirational, and reverberated energy off of each other. Young teenage girls were asking what they can do to promote change, even though they can’t vote. Meghan Goli, senior at McCallum High School, heard about the Teen Vogue Summit Meetup through girls she coded with at Kode with Klossy. Goli had never coded before the two-week intensive camp she took last summer. Now, she is the Vice President of her coding club and hopes to major in computer science next year. Panelists mentioned that taking a break every once in a while does not mean that one does not care, but that they must take care of themselves first. “I had to turn off my notifications, I couldn’t watch the news,” says Juvariya Lat, a fourth-year at the University of Texas, who attended with friend Samar Javed, a fifth-year. They left the event feeling more hopeful than before and understood that it is okay to turn off the news when it becomes overwhelming. This meetup offered a healing space for people to come together despite the difficult events of the past year. The audiences expressed their anger and fatigue and asked the panelists how they take care of themselves. Instagram handles traded, confidence inflated and networks initiated for another generation of women in Austin.